This place in the middle of Schulterblatt is in in absolute contrast to the scenic hip shops and sushi-bars on the Schanze .This former theater has become a successful culture house. 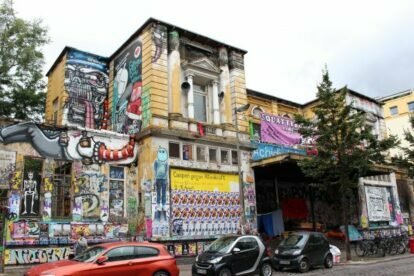 In 1989, in response to plans to turn it into a musical theater it was overtaken by squatters and became the alternative culture house it is today. The facade of the Rote Flora changes every few weeks, from my perspective it is always creatively done. As a political and cultural center, it is the center of a lot of art events, block parties, flea markets, and alternative political neighborhood work. The parties in the Rote Flora are great, which is a great contrast with the pabulum of the scenic Schanze. The music varies from punk, reggae, dub to drum’n’bass or house. The people are very mixed from alternative rasta-piercing-guys to political activists to (unfortunately too many) just-have-fun party people. By the way, beside the parties you’ll find a self-help service station for bikes and the Volxküche (with lunch).